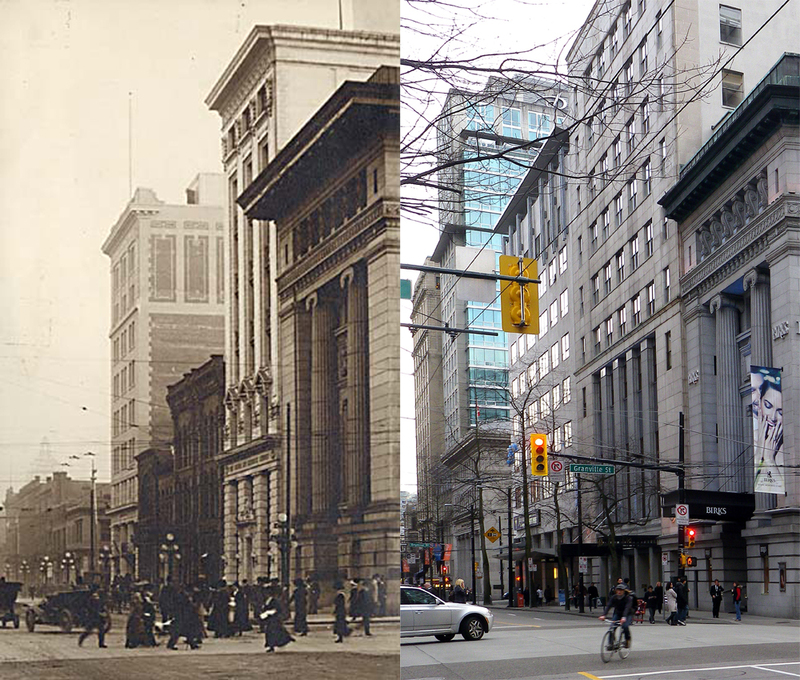 We’ve seen some of the buildings here, on the eastern side of the 500 block of Granville Street in a post from a few years ago, but looking northwards and in the 1930s. This ‘before’ picture is undated, but we’re pretty certain it was shot in the late 1960s or early 1970s before any street trees had been planted. That’s one of the 1954 Brill buses in BC Hydro livery – so between 1962 and 1973. When the new vertical white lights were added to Granville Street a few years ago, and the surface redesigned and replaced, this short section of street was the only one where the existing street trees were considered worthy of retention, and so a taller, more mature canopy exists here. On the left is Somervell and Putnam’s 1916 design for the Merchant’s Bank, expanded in 1924 by the Bank of Montreal to Kenneth Guscotte Rea’s designs. More recently, in 2005, Paul Merrick designed its conversion to the Segal School of Business for Simon Fraser University. Next door, across the lane, is an 1898 building, still standing today. Designed by GW Grant, it was built for W H Leckie and Co and occupied in part by the Imperial Bank, (although that use ended decades ago). William Henry Leckie was born in Toronto in 1874, and moved west in 1896. Although he managed the family business with his brother, Robert, only he was noted in the city’s early biography, although by the early 1900s, R J Leckie and Company also had a successful boot and shoe manufacturing business in Vancouver. Robert had arrived in 1894 to run the Vancouver branch of the business established by their father, John Leckie, who had immigrated to Canada from Scotland. He established a dry goods store in Toronto in 1857 which evolved into fishermen’s supply store, selling oilskin clothing, imported netting, sails, tents, and marine hardware. The firm began to manufacture its own goods, and the brothers continued that expansion by not only establishing this retail and warehouse building, but also owning a tannery on the Fraser River. Later they built a much bigger factory and warehouse on Water Street. William Leckie didn’t constrain his activities to footware; by 1913 he was a Director of the Burrard Land and Improvement Co, the Capital Hill Land Co and of the Children’s Hospital. Next door was a two storey building, completely obscured in the 1970s, and today refaced with a contemporary frontage. Originally it was developed by Hope, Fader and Co in 1898, and designed by W T Dalton. To the south is a third fifty feet wide building. Today it has a 1909 façade, designed by Parr and Fee for owner Harry Abbott. The building dates back to 1889, when it was designed for Abbott (the Canadian Pacific Railway official in charge of the west coast) by the Fripp Brothers. While the collection of buildings has retained the same scale for over a century, rumours suggest a development may see a new office tower that would retain two original heritage buildings facades. Pilkington Brothers built a new showroom, warehouse and glass processing building to the east of this building in 1910, completed a year later. They also occupied the former Oppenheimer Brothers warehouse to the west that had originally been constructed in 1886, one of the city’s earliest structures still standing today. This two storey warehouse might have been an Oppenheimer construction, but it’s more likely to have been Pilkington’s work. Pilkington’s replaced Oppenheimmer’s in 1903, and this was probably built soon after that, in the few years that the building permits are missing. It had the second floor added in 1916 at a cost of $4,000, designed by Somervell & Putnam, who were usually involved in much grander buildings. In the late 1970s this was the warehouse home of US based furniture chain Pier 1 Imports, as seen on the left in a Mercantile Mortgage Company Ltd copyright image. In the early 1990s the building was bought by Bryan Adams, who converted the Oppenheimer’s part of the property to the Warehouse Studios, a world-class recording studio. The later 2-storey building was retained in the conversion (designed by Don Stuart Architects) as a screen wall, with parking behind. The Palace was a very short-lived structure. It appears first in 1898, a wedge-shaped building facing the rail right of way that cut through the heart of Vancouver’s centre (as it still was then). This image was shot a year later. The first proprietor was John Unsworth, who doesn’t seem to have been in the city before the hotel opened, and isn’t in the city after 1900. Mr. Unsworth is a bit of a mystery; his one appearance in the Vancouver Daily World was in October 1899, when he was the witness who complained about the proprietor of the Louvre Hotel (next door to the Palace) selling liquor on Sunday. By that point he was the former proprietor of the Palace, but it’s possible he wasn’t too happy that the Palace had just had it’s licence revoked for having the dining room in a different location than the licence permitted. In 1896 he had taken over the Waverley Hotel in Chilliwack. In 1901 the proprietor was Joseph Caron, but by the time the census was taken that year he was boarding elsewhere and listed as ‘Ex Hotel Prop’, although the street directory doesn’t identify a new owner until 1903 when Schmehl & Muller are listed. They took the name with them when a new hotel opened a bit further west, in 1907. By 1908 the Merchant’s Bank had taken over the premises, and had leased upper floor offices to a variety of mostly medical tenants: an osteopath, two physicians, an auditor, a specialist (Dr Joseph Gibbs, who had moved from Victoria and became BC’s senior surgeon), and Madame M Leo’s massage parlor. Over the next few years some tenants changed, with more real estate related businesses, then in 1912, everything changed again. The Montreal-based Merchants Bank hired the locally-based established architectural firm of Somervell and Putnam to design a new building. It was stone clad, in a classical temple style, but on a steel frame that could have permitted several more floors to be added. However, the economic downturn and the westwards shift of the city’s businesses meant it has never been increased in height. Once the rail tracks were removed in 1932, a small park, officially Pioneer Place bur also known as Pioneer Square, or Pigeon Park was created. Unloved and unoccupied (on the upper floors) for many years, the building was in a very poor state a few years ago, with ornamental stonework crashing onto the park. Restoration to new office use has been slowly proceeding for some time, and the building should once again contribute to a rapidly revitalizing neighbourhood. The Birks Building ranks, we would suggest, alongside the second Hotel Vancouver as the greatest loss of a heritage building in the city. Unlike the hotel, there haven’t been any suggestions of shoddy construction or any deal that it had to be closed because a newer version had been constructed. It was a “10-storey reinforced concrete office/store” costing $550,000 in 1912, designed by Somervell and Putnam for “Birks, Hy. Ltd” as they were described on the building permit. Henry Birks and Sons were based in Montreal and their Vancouver store was veneered with white terra-cotta. It was one of the most elegant and carefully proportioned office buildings designed for the city, still looking good in this 1946 image, and its loss was compounded by the simplistic replacement – the Vancouver Centre. Birks were complicit in the demolition; they teamed up with the Bank of Nova Scotia to redevelop the north end of the block with an office tower, a parkade, and a store (now occupied by London Drugs) completed in 1974. The parkade has a redevelopment proposal as a second office tower, but the prominent Georgia and Granville corner has yet to see anything better proposed than what’s there now – the design of the Webb Zerafa Menkes Housden Partnership of Toronto. 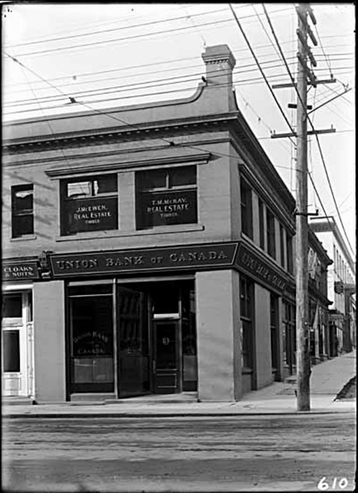 The Union Bank of Canada was built at the corner of West Hastings and Seymour, next to the Innes Thompson Building, in 1920. The Union Bank was started in Quebec, but moved to Winnipeg and became the prairie bank, following the railway westwards as towns sprang up. Crossing into British Columbia took a little longer, and the first appearance of the bank here wasn’t until 1907 when they occupied the premises of a wine and spirits store at the corner of Seymour and Hastings. The bank made some alterations in 1910, and commissioned a new building at 97 Cordova Street in the same year, but it wasn’t until 1919 that they made their grand move, commissioning Somervell and Putnam to design their last commission in the city, a seriously retro temple bank (in an era when far simpler buildings were starting to come into fashion). (We featured an earlier Somervell and Putnam temple bank at Pender and Granville). Not long after their new branch was built the Union Bank, finding itself over-extended, was forced to merge with the Royal Bank (in 1925). The Royal Bank already had a significant Vancouver presence, so they passed the Seymour building on to the Bank of Toronto, who in turn merged in 1955 with the Dominion Bank, but maintained a presence in the building until 1984. Our VPL image dates to 1939, when the Bank of Toronto was operating here. Plans for the demolition of the building had actually been approved until protest from the Community Arts Council (before there was a Heritage Vancouver) saved it, and a revised redevelopment project (that saw the Innes-Thompson block demolished) preserve the building. The architects claimed it was impossible to save the Innes-Thompson facade as well. The Union Bank sat empty for several years, and it wasn’t until 2000 that the new use for the building was completed, with Architectura designing the award-winning Morris J Wosk Centre for Dialogue for Simon Fraser University. The building next door, the Delta Suites hotel by Aitken Wreglesworth, carefully picks up the scale and rhythm of the bank facade in the lower floors. Here’s another view, taken a bit later than our last post (probably in 1911) of the south side of Hastings from Granville, looking east. Now you can see the facade of the Bank of Ottawa Building. The Bank of Nova Scotia absorbed the Bank of Ottawa in 1919 and continued to occupy the building. The Ottawa Citizen in 1909 reported the acquisition of the 52 foot wide corner property, and that the six storey building would cost the bank $250,000. In they end they seem to have got a bargain – although the initial design was attributed to W Marbury Somervell, the building permit was to Somervell and Putnam for $225,000 – and the building was eight storeys. The new bank building replaced earlier structures that included a billiards hall and the Pill Box Drug Store. 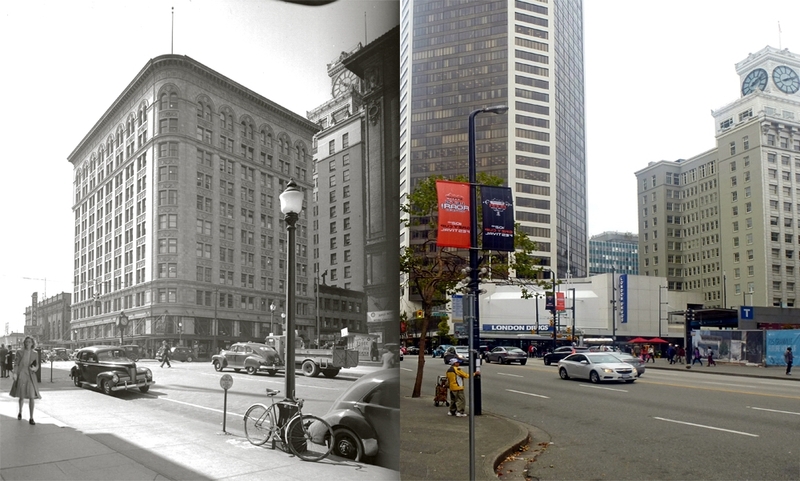 The Strand Hotel was also known as the Delbruck Block, and where the recently completed Canada Life Assurance Company building stood had been the site of the Leland House Hotel. The Canada Life Building had a branch of the Imperial Bank of Canada as well as lawyers, brokers and government offices. The Bank of Commerce on the corner also had tenants upstairs in ‘rooms’ including a number of land brokers and William M Dodd, architect. Mr Dodd, although not widely recognised, obtained some sizeable contracts including a $200,000 apartment building at Granville and 12th that is still standing today.